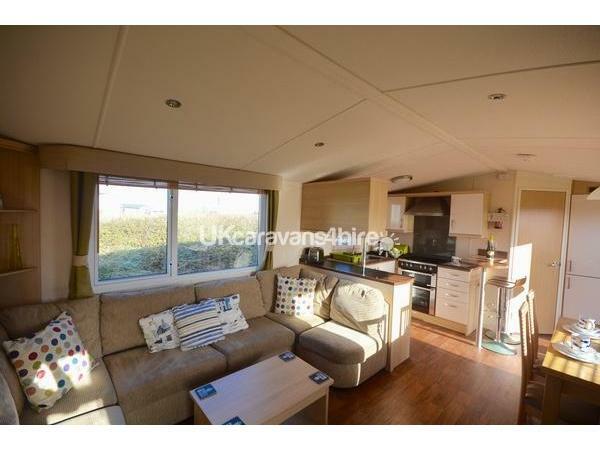 Additional Info: With partial Sea Views and finished to a very high standard, this is a gorgeous caravan graded by Haven as 'Prestige'. 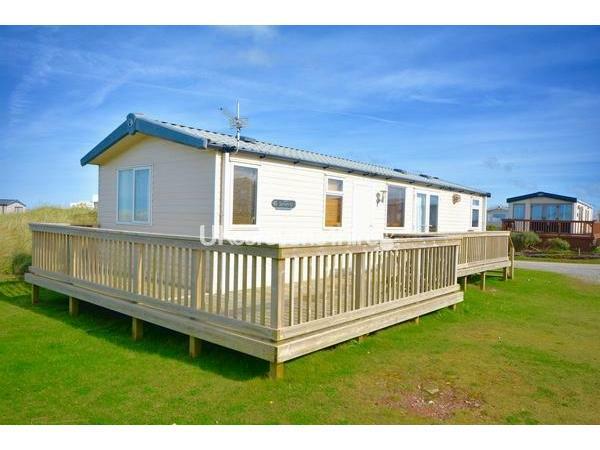 Located in Chy-an-Mor, you will enjoy a slightly quieter feel, whilst still being a short walk from the central site amenities. You will be able to enjoy the decking at the front which also wraps around the side, providing an additional space to sit relax and benefit from the vista and a secure area for your younger family members. 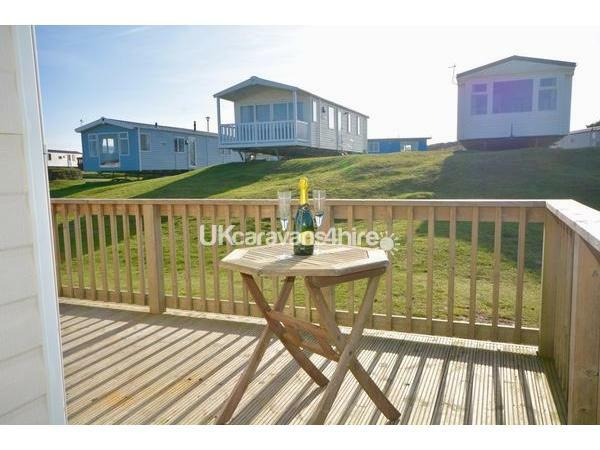 There is outdoor patio furniture and all bed linen is provided within the price. 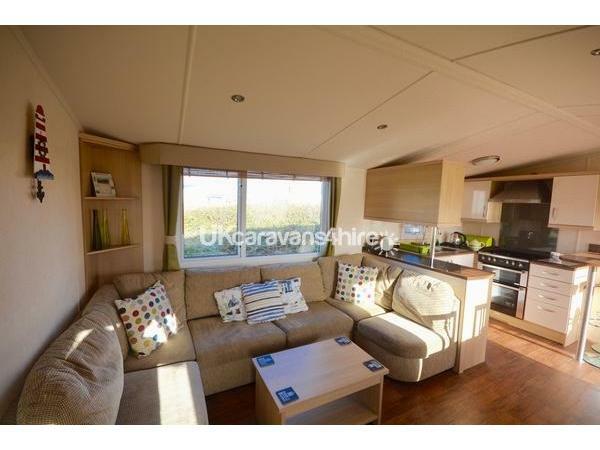 This is a Prestige Graded, luxury 3 bed, 8 berth caravan. With a view of the sea from the large wrap round South Westerly facing balcony, you will enjoy sunshine throughout the day (Cornish weather permitting). Complete with outdoor patio furniture, it is the perfect place to sit and relax. There is a nearby walkway providing direct access to the rolling sand dunes of Perran Sands and the stunning beach which is lifeguard patrolled at peak times. just a short walk away are the array of amenities and activities available at the holiday park. Private parking is available beside the caravan. You will have all little touches and comforts to make your holiday experience even more special. With central heating and double glazing you are guaranteed to be warm and cosy even on those chillier of evenings. an iron/ironing board arenlso provided within the rental price, meaning less to pack. 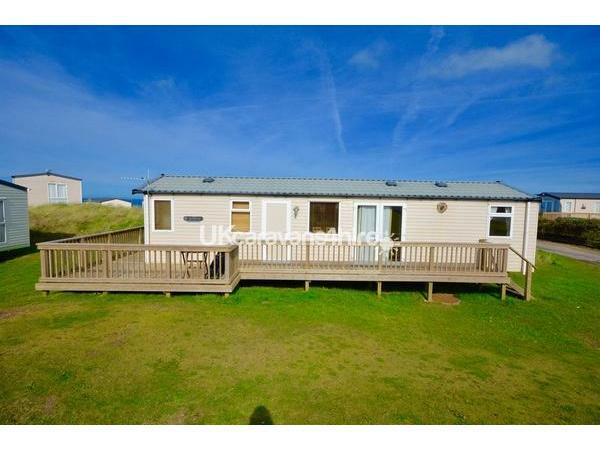 With its central lounge and open plan kitchen/dining area this is the ideal family holiday home. 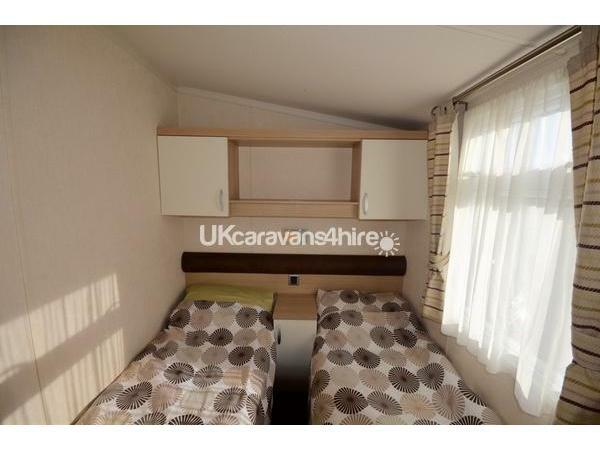 With two twin bedrooms and Shower room & WC at one end of the caravan and the master bedroom with en-suite shower room at the opposite end, the kids can have their own area. At the centre there is a contemporary lounge, with 32" wall mounted TV/DVD Combi, Electric Fire, large corner sofa arrangement and free standing coffee table. The wood effect flooring completes the clean modern look. The well appointed kitchen with breakfast bar has ample storage. 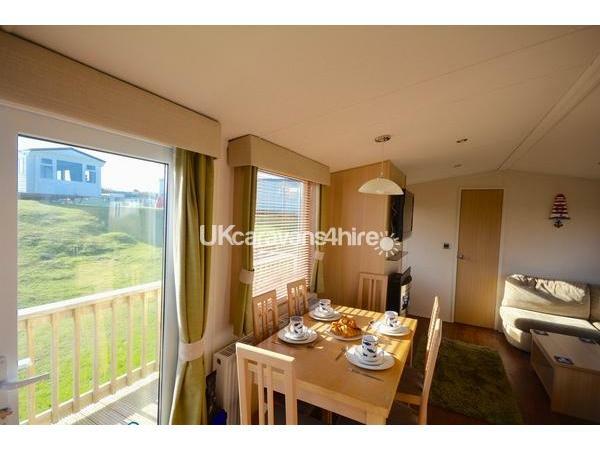 With a full sized integrated fridge/freezer, 4 burner gas hob and oven, microwave, kettle and toaster. The large dining table with 6 chairs ensures that you can cook, dine and relax in comfort. Leading off the dining area are the french doors which take you out onto the decking area. A 4'6" double bed complete with duvet, pillows, ensures you have everything you need for a perfect nights sleep. 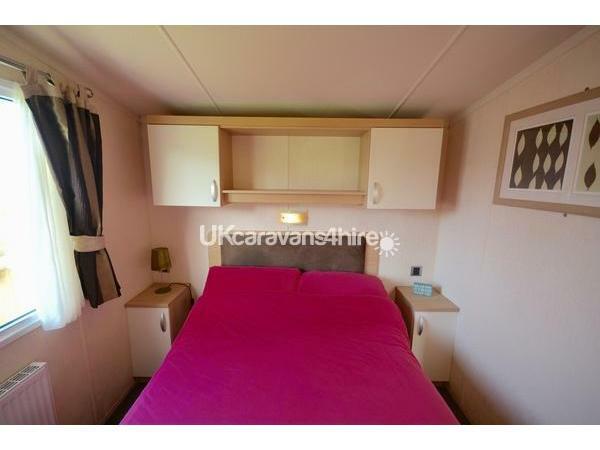 There is ample storage too with wardrobe, overhead cupboard space and two built in bedside units. Leading off the master bedroom is an en-suite shower room with WC and hand basin. We even provide a hairdryer plus iron and ironing board for your use. 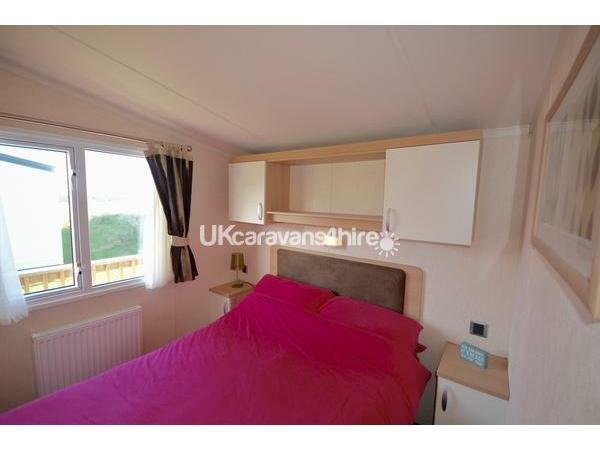 At the opposite end of the caravan are the two twin bedrooms. Again with duvets, pillows and all bed linen provided. 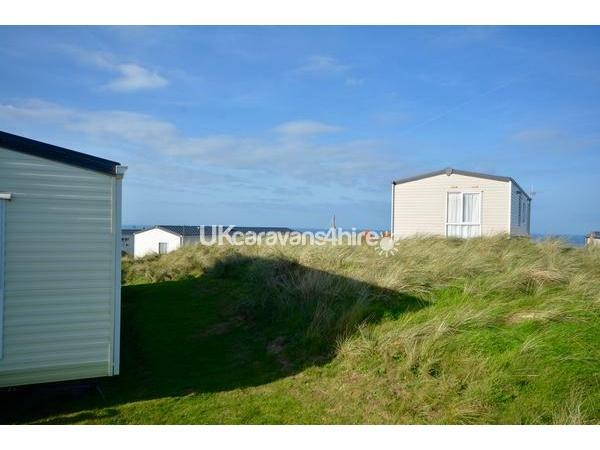 Also at this end of the caravan there is a separate bathroom complete with shower, WC and hand basin. Plenty of parking is available beside the caravan.